Primobolan Depot is the injectable version of the steroid methenolone. This of course is the same constituent in Primobolan Orals (methenolone acetate). 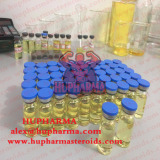 In this preparation, an enanthate ester is added to the steroid, which causes a slow and gradual release from the site of injection. Its duration of activity would thus be quite similar to Testosterone enanthate, with blood levels remaining markedly elevated for approximately two weeks. Methenolone itself is a long acting anabolic, with extremely low androgenic properties. On the same note the anabolic effect is also quite mild, its potency considered to be slightly less than Deca Durabolin (nandrolone decanoate) on a milligram for milligram basis. For this reason, Primobolan is most commonly used during cutting cycles when a mass increase is not the main objective. Some athletes do prefer to combine a mild anabolic like “Primo” with bulking drugs such as Dianabol, Anadrol 50 or testosterone however, presumably to lower the overall androgen dosage and minimize uncomfortable side effects. When choosing between Primobolan preparations, the injectable is preferred over the oral for ail applications, as it is much more cost effective.